One of the best, or should I say the best brutal band from Italy. 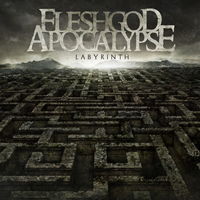 Their 2011 album 'Agony' was a real hammer and now, exactly 2 years later their new album 'Labyrinth' is released. I can reassure the fans that this is again a step ahead and their best album so far. Again influences of Septic Flesh, Dimmu Borgir, Epica and Anorexia Nervosa can be heard in their music. Some will again call this completely over the top, but it is more balanced than on 'Agony'. Another advantage is the falsetto vocals; this time for the biggest part done by Veronica Bordacchini instead of bass player Paolo Rossi. Veronica does a better job (less false) than Paolo did on the predecessor. Another difference from their 2011 record is the tempo of the songs. This time it isn't full speed ahead from start to finish. There are more resting moments like piano parts, classic guitars and more variety in the rhythm. The production is top notch, just listen to the drums and the mighty bombastic orchestral parts and choir singing. In 2011 I wrote in my review that 'Agony' would be in my end of the year list and I'm sorry that I'm so unoriginal, but I have to make the same conclusion. Technical symphonic death metal will not get much better than this!